We know it’s hard to believe, but 2018 is almost over! The holidays are slowly creeping up on us and before you know it, you’ll be ringing in the new year. The beginning of the year is an exciting time where anything is possible. It’s the perfect opportunity for you to believe in yourself and believe in making the big changes that you’ve always been dreaming of. If you’ve been debating if beauty school is right for you, there’s no better time to pursue it. We know it’s always easier said than done- and doubts will always try to creep in- but with all the current booming opportunity, now is the time to show those doubts who’s boss and get enrolled for 2019 to finally pursue your dreams! With new breakthroughs in technology and the job market for the beauty industry expected to rise, there’s no better time for you to attend beauty school. Here’s why 2019 is the perfect year for your start in the beauty industry. So many people only go to a traditional college because it’s what they’ve been taught is the next step after high school. Don’t believe a word of that! More and more people are finding alternatives to traditional college to find something that fits them specifically. Traditional college is great for people who want to take that route but it’s by no means the only option. If you’re dreading the next semester of college classes, it might be time to realize that it’s not the right path for you. You don’t want to suffer through another year of doing something you don’t even enjoy. It might seem daunting to leave but trust us, you will be so much happier when you’re in a college that appreciates your talents and creative ideas. Your family members and friends might try to convince you to stay in traditional college but you know yourself best. You deserve to do what makes you happy! You may be holding back from enrolling in beauty school because you think a salon will be the only career opportunity in your future. That is definitely not the case! While some choose to work in a salon, there are plenty of other options if that work setting doesn’t appeal to you. Our Career Dreams series covers just some of the possibilities you can do after beauty school. The world right now is changing rapidly and the great thing about the beauty industry is that it’s always adapting. A beauty blogger is just one example of a career that wasn’t possible before the internet entered our lives. It feels good knowing that the industry you work in is always updating itself to keep relevant. We can’t wait to see what the beauty industry is capable of in the years to come. Speaking of always staying relevant, people within the beauty industry can relax knowing that they work in one of the industries that are least likely to be replaced by robots. We live in a technological age and it’s only going to get more advanced. Our world is constantly pushing the boundaries on advanced AI (artificial intelligence), and we can soon expect jobs to be replaced by them. That may scare others but not those with a license from beauty school. There’s something special about the creativity of a person that a robot just can’t replicate. Like we said, this industry is always changing and that means it requires people who evaluate those changes and adapt to them. Going to beauty school is the first step to finding a job that values your unique talents. With technology quickly advancing, there’s no better time to work at a job where people expect human creativity. You don’t have to wait until robots take over to see how high in demand you’ll be as a beauty school graduate. Already the job market is booming for beauty-lovers! According to the Bureau of Labor Statistics, employment for Barbers, hairstylists and cosmetologists is expected to grow 13% from 2016 to 2026, massage therapists by 26% from 2016 to 2026 and skin care specialists by 14% from 2016 to 2026. With 2019 right around the corner, these careers have been rising the past few years and they will continue to rise for several years to come. The beauty industry is truly gaining speed and there’s no better time for you to get involved in it. So if someone asks if you’re sure that enrolling in beauty school is a good idea, just show them these numbers. Maybe you’re already passed the doubts of whether or not beauty school is worth it in today’s world but you’re still unsure if you have the capacity to enroll in 2019. If that’s the reason you’ve put off beauty school then you can cast those doubts away. Everyone who has the passion for beauty is capable of completing beauty school. Beauty school is a place for people of all ages and backgrounds in beauty. Don’t hold off going because you think you’re not good enough. You go to school to become better! As long as you come eager to learn with a positive attitude, you’ll be ready to enroll and start your new adventure. Don’t wait another year to start your dream! The next year is the perfect time for your start in beauty school. If you’re ready for 2019 to be full of exciting opportunities, you should check out our programs. We offer cosmetology, massage therapy and esthiology programs so you can go in depth with the specialized skills you’re most interested in. Our day and night classes ensure that anyone who wants to go to beauty school is able to fit it in their schedule. Make this the year that you stop making excuses of why you can’t go to beauty school, cast your fears aside, and go get those dreams! Contact us to find out how you can enroll. 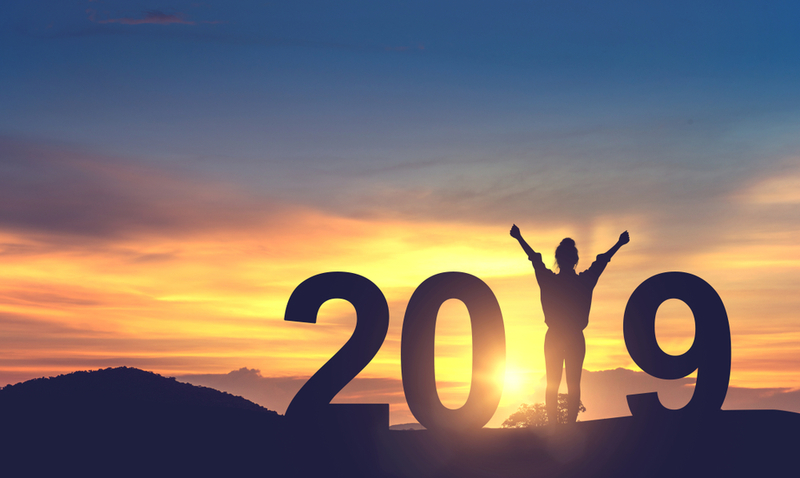 We can’t wait to see what 2019 has in store for you!